Ella has gotten into a plane and flown away. Here are a couple of highlights from her last day here — we went out on the town (Waikiki, of course). Ella Meets and Greets Eats. She found, being short, it was difficult to get people’s attention, but fairly easy to climb up on the coffee table in the lounge and eat all the cheese pizza appetizers. After the meet and greet we went out on the town. Ella got very excited when she saw the dolphin and asked it for a ride. It obliged. 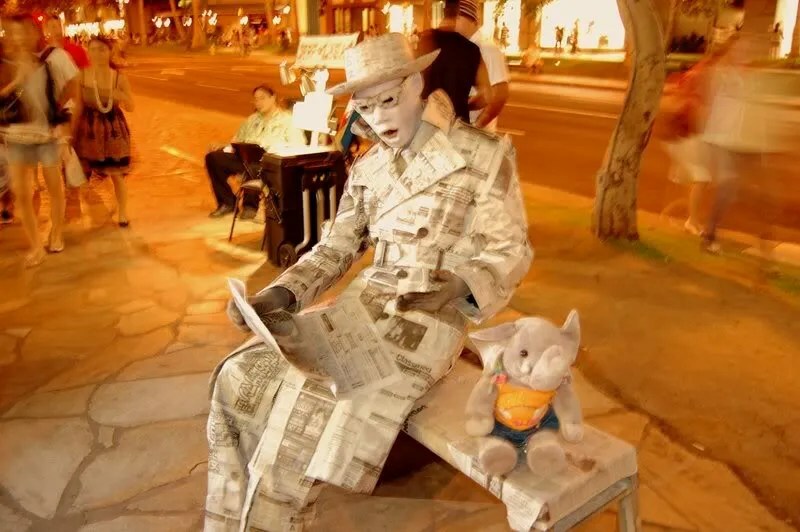 Then, while we were out and about in Waikiki, she met a man sitting quietly on a bench reading a newspaper while folks all around took pictures of him. You know how Ella loves attention. She climbed right up next to him and took a small piece of his fame — or perhaps gave him some of hers. She had a blast in Waikiki, but we had to get home to bed so she could get her beauty sleep. She was speaking the next day at PodCamp/WordCamp Hawaii 2008. Here she is, speaking from the podium. Afterward she had her photo taken with a couple of very young fans, then we had to run. She was so tuckered out when it was time to go, she curled up in her travel kennel and went right to sleep. I predict she doesn’t wake up until she reaches Texas. Trust me, you’ll get the hang of the website in no time. Of all my friends that I have walked through websites, you’re the one I worry about the least. Bye Ella! It was nice meeting you, and I hope you have a safe trip to Texas. So that’s what’s going on! I bet you’ll miss Ella. Just know she’ll probably have a huge time in Texas! Be back soon to see how things are going here – hang in there. Will you be able to import all your previous posts from both Blogger and WordPress? When I changed the settings on who can comment on my blog you were still with WordPress, It wasn’t me that banned your new URL, it was Blogger. But it is now fixed and you should be able to post with your new URL. I bed Ella will be homesick when she has left for Texas ! Where is she going ?? I am a little lost on this blog, couldn’t find where to comment and was ready to send a mail, lol ! I will get used. I am not a big technician either, I am already happy to get along with Blogger at least for what I need. What is the interest to pay for a Blog if you can get it for free ?? I am quite happy with Blogger. I think all providers have their pros and cons. Ohhhhh well … maybe you can go move my comment from where I don’t belong over here to where I DO belong! LOL! Cuz I was just followin’ email instructions!!!! Glad you’re back safe and sound. I’d flip if my blog suddenly disappeared. I must confess though, I’ve been a bit out of the loop and hadn’t realized you were gone. Glad your sort of back. I left a comment on wherever I ended up yesterday but it looked like something from last year. I bet you will miss Ella. Glad she had some special fun as her vacation with you ended. Good luck with the new blog. Ahhh! I might have knOwn Ella would finagle a dolphin ride while in Hawaii! That girl LOVES her dolphins! I’m certain she was MUCH more entertaining than the mime… He should add her to his act…. ooops – can’t! She’s gone! Poor fella! Well… I wonder what she’ll get up to in Texas… Safe travels my dear! IG — I think I just figured out the FTP thingy. Carletta — I seem to be catching on. Bill — all of them I want to — that’s my next project. Gattina — Melli sez Ella is going to visit Twila. Melli — done. You need to read ALL your mail before you go gallivanting off to comment. Robin — I love that ringing endorsement of my content …. Dr. John — I think I am solidly here! Melli — that mime was holding perfectly still, hadn’t twitched a bit while folks pictured him, then I finally got a chance to set Ella down and he came to life! He showed her something shocking in the newspaper (I didn’t get to see what.) And he waved good-bye and wiped a tear away when we left. I second Gattina on this one, why pay if you can have it for free? I feel okay with Blogger, have not yet had any serious problems except when I installed the Haloscan comment form. I lost all my comments from Blogger, and there was no way I could retain them except copy paste them from my e mails! Fortunately, it happened when my blog was only ten days old, I would have hated loosing a year’s worth of comments! I’m sure you miss Ella, I know I’m going to miss her too! FTP is fun. Get it setup, click a button, suddenly you have bunches of files, and access to new themes, plugins, and other website sparklies. ella is having more adventures than paddington!!! i’m sad she’s on a plane. it’s not right! Quilly, I had my own domain for a year, but I just couldn’t figure out how to use the program I had to use to put a blog up there, so I never did do anything with it… so now stick to my free blogs. 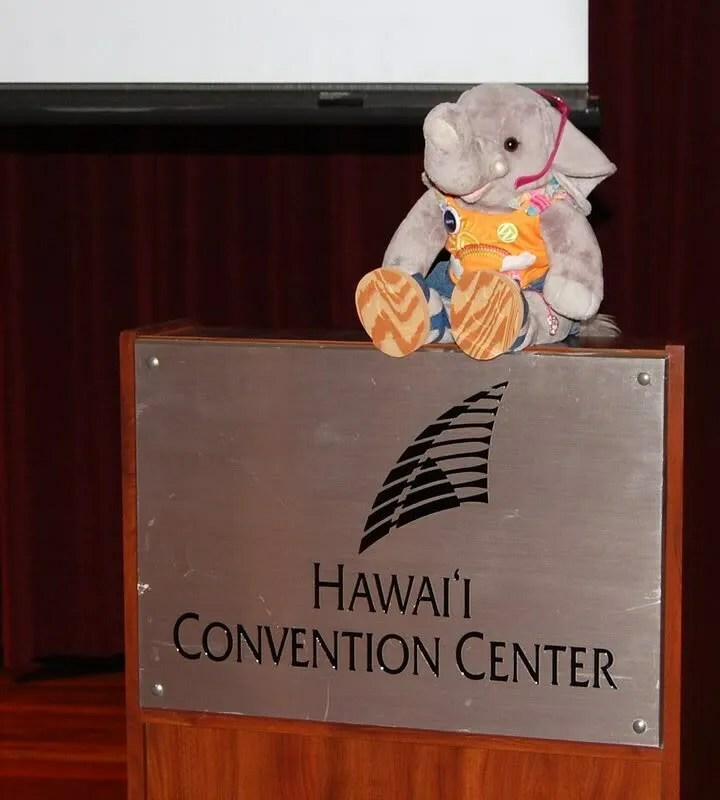 It looks like Ella had a wonderful and wonder full last day with you in Hawaii. I bet you and OC sure miss her now that she’s gone, and I’m sure that she will have very good memories of her visit with you. 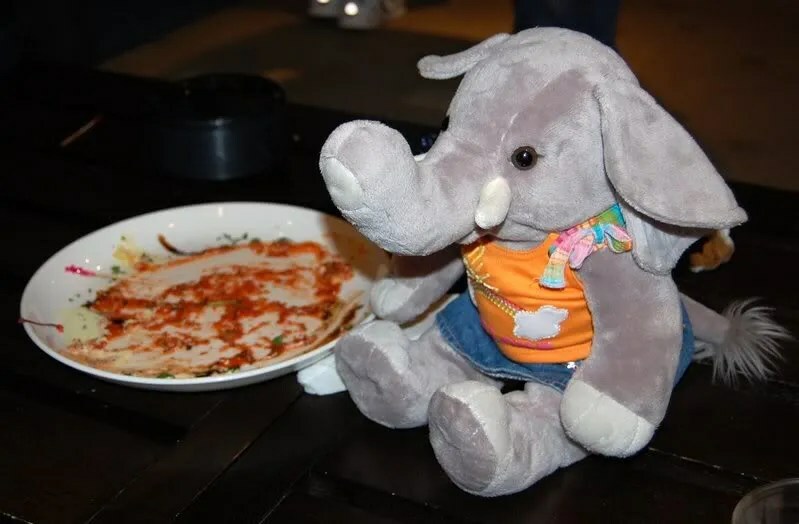 They say, by the way, that an Ella Phlint never forgets. DW is sitting on my shoulder preening herself and wanted me to tell you “pretty blog”, or something like that, haha. Silly bird has been ‘in a mood’ lately and biting me a lot, now this evening when I got home she didn’t hesitate to hop onto me and ride around the house on my shoulder, eating a cracker bit by bit. She doesn’t seem to want off. She’s being unusually friendly now… go figure. I’m liking it anyway. Haha. Jientje — for the things I will now be able to do which one cannot do on a free blog. IG — looking forward to having the time. Holly — what, you want her to swim to Texas? Alice — you should have installed WordPress. Writing the posts aren’t my problem, it was getting the whole thing set up! I think I’m good to go, now. Quilly, I did install WordPress, and I am usually pretty good at figuring out how to use different programs and such, but I just couldn’t manage it with WordPress. I just got so upset and frustrated every time I even tried to do anything with it. Each page of instructions had 50 or more links to other ‘must read’ pages, and each of those had just as many links to more ‘must read’ pages and each of those….. and on and on it went. If I had 26 hours each day to sit and read then MAYBE, just maybe I might have been able to figure it out… but I doubt it. haha. For me, WordPress turned out to me WordDepress, or WordSuppress. Alice, to me WordPress is the easiest blogging platform to use. They are sticklers about the quality of the code that goes into their products and work very hard to make certain everything works as it should. They have also made some incredible upgrades and they just keep making it better and easier to use!